Stand mixers literally are the work horse of the kitchen if you like to bake and are used for just about every mixing job that needs to be done of heavy items such as cake, pie and bread dough ingredients. This piece of cooking equipment is definitely an excellent investment which will save you time and labor. There are some things to look for when considering this piece of cooking equipment for purchase. Since these mixers are the work horse for baking, the mixer needs to be of very high quality with a powerful motor since you will be handling heavy ingredients such as flour and dough. The mixer should also be sturdy so that it doesn’t bounce around on the counter during mixing. A good quality mixer should have a powerful motor, a stationary bowl and single mixing arm, the bowl should be tapered, the bowl should be at least 4 ½ quarts, and the mixer should have some basic attachments which include: a flat paddle for general purpose mixing, dough hook for making breads, metal balloon whisk for incorporating air into your mixtures, and a pouring shield. The mixer should have at least 10 speeds since the different attachments require different speeds for different ingredients. Generally you can use the metal balloon whisk at high speeds for whipping egg whites into stiff peaks by incorporating air into the egg whites which is how the stiff peaks are formed since this requires a high speed and is much faster than using a wire hand whisk to incorporate air by hand. Due to the delicacy of the whisk it is mainly used for whipping egg whites, this attachment should not be used for anything heavy such as dough since it will alter the shape of the whisk and possibly bend it out of its natural shape, there is an attachment for handling dough. The speed that is generally used for whipping egg whites is the beat speed which on most mixers is generally speed number eight. Using the slow speed which on many mixers is speed number two is equivalent to stirring and is generally used with the flat paddle and dough hook to incorporate ingredients at a slower pace, especially when for some recipes you might want a rougher more crumbly texture such as with dough. Speed number six on many mixers is generally used for creaming, especially cake batters using the flat paddle. The mixer should always be cleaned well after use to prevent bacterial growth. The different attachments should be cleaned well and the attachments can be cleaned in the dish washer if your manual recommends it. These attachments can also be cleaned by hand, especially the balloon whisk which is metal wire and of a delicate construction. A good quality mixer is generally a little bit pricey so you do some research and compare different before any outlay of money and the mixer should life you for years to come, and a good quality long lasting mixer doesn’t come cheap. If you want to make your stand mixer even more of a workhorse, there are some great optional attachments available for these mixers such as food grinders, pasta makers, sausage stuffer, fruit and vegetable strainer, citrus juicer, slicer and shredder, grain mill, can opener, food tray, pasta roller, and water jacket. 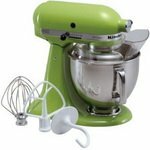 Below is a nice video from ehow.com on using a stand mixer.